This is one of my favorite dishes. Whenever ginisang monggo (mung beans) is being cooked at home, I always ask for around half a cup or so of the freshly-boiled monggo and some of the water it boiled on, then I mix some sugar on it and presto! A sweet concoction I think noboby else does but me. It tastes like hopia monggo (another favorite!) without the flaky bread crust. My Nanay had gotten so accustomed to my request that she would usually add more than the usual monggo beans to boil. And of course, the ginisang munggo is truly the perfect dish on a cold rainy day. Paired with some dried or smoked fish and you have a wonderful wonderful meal! Wash monggo beans, then place in a pot an pour water in. The rule of thumb is to have around twice (or a bit more) as much water as the beans. In the process of washing and submerging the mung beans in water, you will notice some of the beans will float. These are empty, so just discard these. Bring to a boil then simmer for half an hour or so. 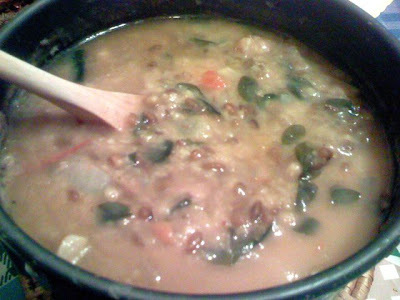 You can add more water (preferably hot) in case the mung beans absorb much of the water; just keep the beans slightly submerged. Try to squish a bean against the side of the pot with a spoon to see if it's already soft and cooked. We like cooking the pork bits in a bit of water so you can also try this. In a deep frying pan / wok, place the pork bits and just barely submerge it in water. Set to medium heat. The water will soon boil and evaporate from the pan. Occasionally stir the pork bits so it won't get burned. The pork will release its own oil (the saying "getting fried in your own oil" comes to mind). At this stage, you can add cooking oil to push the frying process along. When the pork bits are done, move these to one side of the pan and saute the garlic, onion, followed by tomatoes. Then mix in the pork, followed quickly by the cooked mung beans. You can add in some of its water if you want your ginisang monggo to be soupy. Mix a bit, then turn off the heat and add the greens (malunggay or ampalaya). 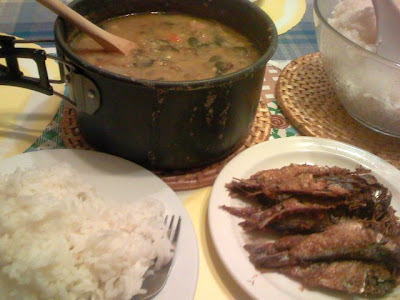 Serve with hot, steaming rice and some dried or smoked fish. I can smell the tuyo just by looking at this photo!